“All good things come to an end sometime. This weekend sees the last of what has been a truly excellent experience. Thank you all & best wishes for the future of bowls everywhere”. These were the last words on the back of the programme at Sunday’s last ever after-match meal at The Oxford Bowls Club. 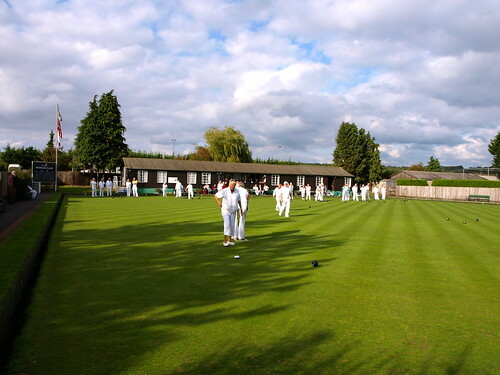 A mixed rink each from Banbury Central, Carterton, Headington, Oxford City & County, South Oxford and Watlington had been invited to take part in what will remain a very memorable event for them, the very last game on the green at The Oxford Bowls Club. Many of the visiting players will have various memories of playing on the green, no doubt happy ones when they won and not so happy ones when they came second. The club under a variety of names has a history going back to 1953 when the club started and was then called the Pressed Steel Bowls Section. In 1983, the name changed to Rover (Cowley) Bowls Club. 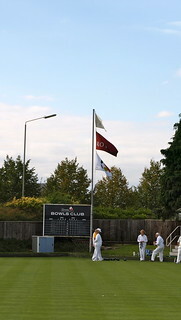 In 2011 it’s name changed again, this time to its final name,The Oxford Bowls Club. Rover is the name that most of today’s bowlers remember the club by and more than likely will be for years to come. Flags representing the clubs three titles fluttered proudly in the afternoons gentle breeze. After the meal, President Jim Warland expressed his thanks to the many persons that had been instrumental in the fine running of the bowls club over the many years, along with thanks to those individual guests and guest clubs who had joined the club members in celebrating this memorable day. OBA Competition Secretary, who had brought a rink from Banbury Central, thanked the club under it’s many titles, for the support that it had given to the County over the years in making its facilities available for representative games and County Competitions, before assuring members that their membership of any club in Oxfordshire would be welcomed with open arms. Chairman Roy Edney confirmed that the clubs last result was a draw, three rinks each. A very fitting end. It was with sadness that I read of the end of the former Pressed Steel bowling green. From memory my late father Harold Hull was responsible for the green probably from its beginings in 1953 until he retired in 1961, following which he went on to South Oxford Bowls Club. I recall the loving care and attention he gave to the green and learned to appreciate that a bowling green is simply not just another piece of grass, but like the centre court at Wimbledon is something that constantly needs to be maintained. Although he died some years ago I think it would have been a sad loss to him to see it go.